WoW subscriber losses since Q1 2011: 2,900,000. SWTOR subscriber losses since Q1 2012: ~700,001. Aion subscriber losses since 2011: ~600,000¹. RIFT subscriber losses since 2011: 350,000¹. 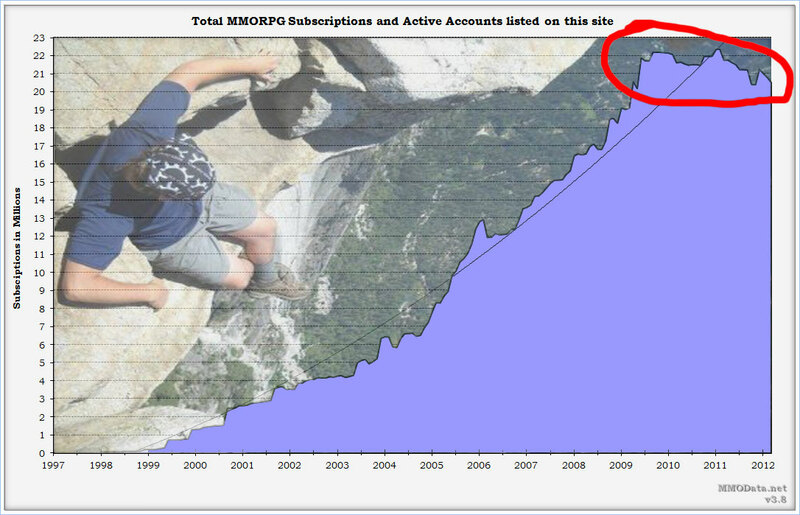 LoTRO subscriber losses since 2011: 300,000¹. EVE subscriber losses since Q2 2011: ~20,000¹. It is seductively easy to imagine the MMO landscape as a zero-sum, closed universe. One developer’s bone-headed design mistake is another MMO’s gain. “Guild Wars 2 is going to nail the coffin shut on SWTOR/steal another million from WoW.” But it is fact that there are less people playing “traditional” MMOs today than there were in mid-2009. And there were fewer game options back then! The graph up there is somewhat misleading in two ways. It does not represent the entire MMO market (browser-based games, etc), so it is entirely possible that in the journalistic sense the “MMO” market is doing perfectly fine. But it is misleading in the other direction too: do you really care how Second Life and Dofus and Asian MMOs are doing? There are a lot of games you will never play and/or people you cannot possibly play with that are propping up those numbers. The Truth™ is liable to paint a much bleaker picture. I think we may need to start entertaining the notion that the entire genre – as we know it – has peaked. Not just the hot topic of F2P vs Subs, but the whole damn shebang. Classical arguments like “WoW lost subs because grinds/attunements/etc are good” become embarrassingly moot (if they were not already). Where are the bodies? Whoever is leaving does not appear to be coming back for a second date, or even meeting new people; they have simply vanished back into the ether. Speculation on the whys seems moot as well, because there is zero indication the ex-pats transition anywhere else. Rather than go to the alternative MMOs that offer grinding/feature no grinding, they simply go away. A year ago yesterday I was doing Firelands dailies. So… we have located at least one body. A body with an extra $179.88 in its pocket at that. ¹ Based on eyeballing this chart, which hasn’t been updated in a while. Posted on August 8, 2012, in Commentary, MMO and tagged Anti-Anniversary, EVE, MMO, Subscription, SWTOR, Where Are All the Bodies?, WoW, Zero-Sum. Bookmark the permalink. 16 Comments. Well, for me personally, I spend most of my time playing Lotro unsubscribed. I’ll subscribe a couple times a year for unlocks, and buy some points and the expansions, too, so I’m still a perfectly fine revenue stream for them that would approach a subscription. But I’m not a subscriber, and I don’t think they mind. Really, Given the variety of payment methods, I don’t know if it’s even all that meaningful to talk about subscribers at all any more, at least as a metric of the health of the industry. Here’s an easy example. Let’s imagine that players were indeed zero sum: a player will only play game A or game B but not both, and will always play a game. In this scenario, every GW2 player that moves over from a subscription game will take the industry another step down from it’s “peak.” But if GW2 succeeds beyond expectations do we really want to conclude that the industry is in freefall? It is my fault for not using more precise language, but MMOData does differentiate between subscription games and non-sub games. The latter is measured in Active Accounts, which is defined as: “For an account to be regarded as active, there must be a completed login into the game server at least once per month.” So, when I mention that, say, LotRO shed 300k subs, there was actually a 300k drop in F2P users. Assuming that MMOData picks up GW2 numbers via Active Accounts, we could see if there is indeed a mere shifting or a more worrisome sifting. I’m concerned that MMOData hasn’t been updated since May 8th though. 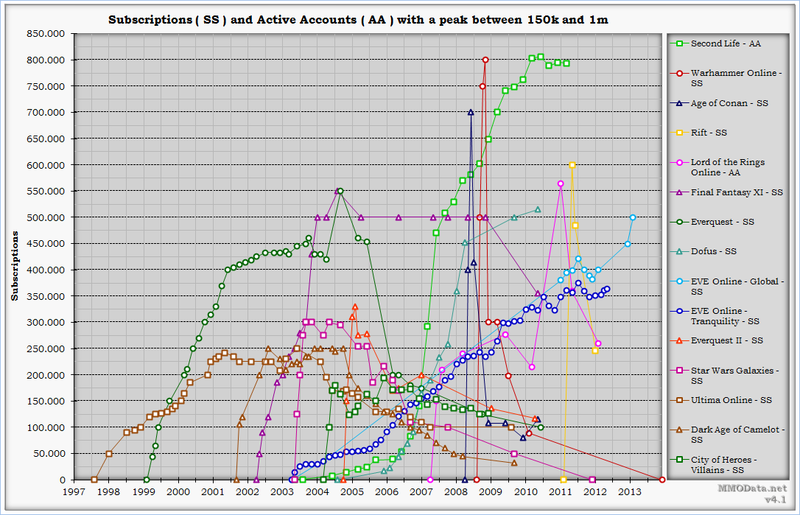 Armchair MMO design and rampant speculation is much less interesting without reliable graphs. Huh, I am kind of mystified that anyone would think anything BUT that the MMO market is passed its peak. I don’t think that indicates some death of MMOs or whatever the latest chicken little line is, but at its height WoW brought people into the MMO scene who otherwise would not be MMO players. That’s how fads work. Based on my incredibly limited sample size of people I know, I’d say in the last two years 20% are still playing WoW, 50% are playing other MMOs and online games, and 30% just don’t play MMOs or online games any more as far as I know. Well, if everyone accepts the premise that the MMO market itself is naturally contracting/bottoming out, it makes a lot of the traditional “THIS will fix WoW (etc)” arguments silly. Who wants to hear about someone’s brilliant new LFD fix that will make it so that only 100k people will unsub this month? Then again… maybe this is a win-win for the old guard? Smaller population = better communities. I was about to suggest that production values would decrease too, but… that may not even necessarily be the case either. Hmm. You forget the new player. WoW is 8 year old, that’s a half generation. I’m not subscribed to any traditional MMO at the moment. I’m still playing the hell out of Diablo 3, though. Obviously it only affects the last few months of your curve, but 10 million sales of a B2P game which, while not an MMO, has a lot of crossover appearl.. that has to have an effect. Even if there are a particularly noisy bunch of whiners insisting that it’s the worst game ever and nobody plays it anymore. I rarely think about the cost of WoW to me, and when lines like this attract my attention to the “problem”, I realize how incredibly cheap an MMO is compared to any other activity. On visit to the cinema/week would be twice that, and if I have a look at my expenses, the “entertainment” section is topped by “restaurants” sitting at around 1kE/year…. MMOs are indeed cheap when used as replacement for other entertainment. But that was never true in my case, even during the heights (depths?) of my guild-leading days. WoW alone wasn’t enough; or rather, I also wanted to play the occasional FPS title or indie game too. Funny thing is that after I quit, all the time I normally spent playing WoW was immediately filled with browsing CNN.com, reading blogs, and (eventually) writing blog posts. In other words, I gained zero extra game time. And those activities actually beat even WoW’s $0.08/hour entertainment cost. Yet there’s also new MMOs like TERA and TSW. As for you, you seem to be an experimental game tester or reviewer. I admire that. But I myself have also a different way of playing games: if I really like one, I will keep playing it. For example FPS games like: Quake 2 Lithium, CS 1.6, RTCW: ET, CoD4: MW I have each played very, very, very much even long after they were released. Each of these 4 games I found very good. Same with the experimenting and reviewing. Can lead to less time to play sub-based game, or an MMO, such as WoW. Which explains why “GW2 can kill WoW” (the “kill” is quite a dramatic argument tho; of course it should be read as “hurt” and then, “how much”?). Does the average player have a finite time he/she is willing to play MMOs? The games seem to be designed around semi-addictive reward mechanisms, but those mechanisms also seems to lose their strength over time. This could explain why ones infatuation with subsequent MMOs are more subdued and shortlived. Perhaps MMOs were always destined to go away, or at least greatly shrink, once enough players had become resistant to the reward mechanisms. It is a good question. I was thinking the other day as to why I never get tired of FPS games in general, despite them all being superficially the same. Or maybe I would if I played them on the same level of intensity over the same number of years. Chalk up one body here who hasn’t played an MMO for over a year and is addicted to Crusader Kings 2. But really, what MMO would I currently waste my time on and pay to play? Bit late to the party (legs falling apart) but this body here is playing the same amount of total time as when subscribed (to WoW) – in whatever game she pleases when she pleases for as long or short a session as she fancies, with whom she (you get teh idea) – and paying when they offer something she likes and wants … I gotta really nice coffine the other day… there has been shift in power from the devgods to the walletbearers? The really interesting thing is that there was actually growth throughout all of 2009, and peaks of growth thereafter. US unemployment peaked in October 2009 and hasn’t been below the unemployment number set in February of that year. Maybe part of what we are seeing is people being more conscious of where that $15 is going and unsubbing when they aren’t playing anymore instead of letting inertia or hope keep them subbed. Not to say that some aspects aren’t just crap games or crap decisions, just that economically this is the worst recession we’ve had in over 70 years, maybe more, and I think that needs to be a part of the whole discussion. Wow, that’s one messed up wordpress name.